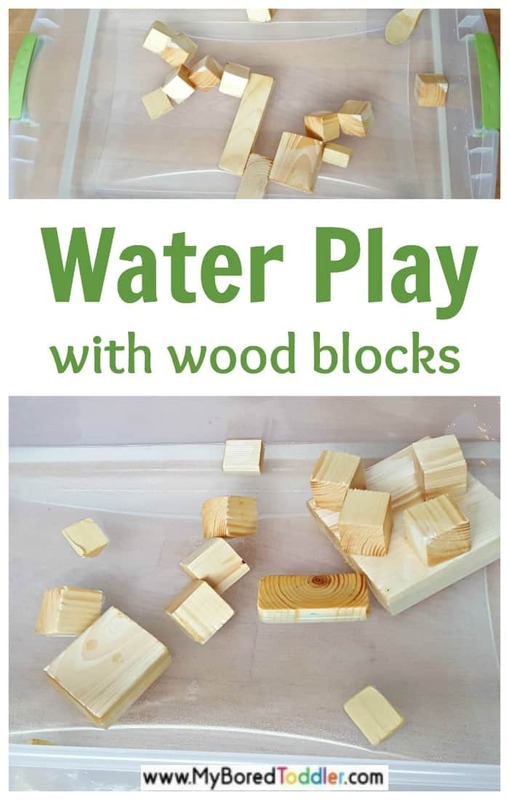 We are loving this water play with wood blocks activity in the warmer weather! 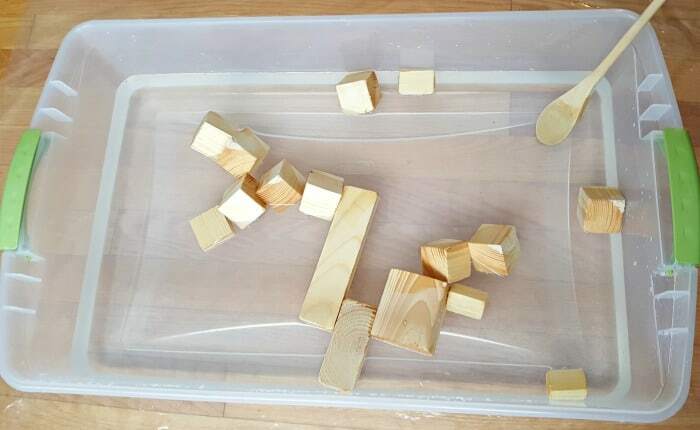 Wood blocks in the water bin provide a great water play activity for toddlers. 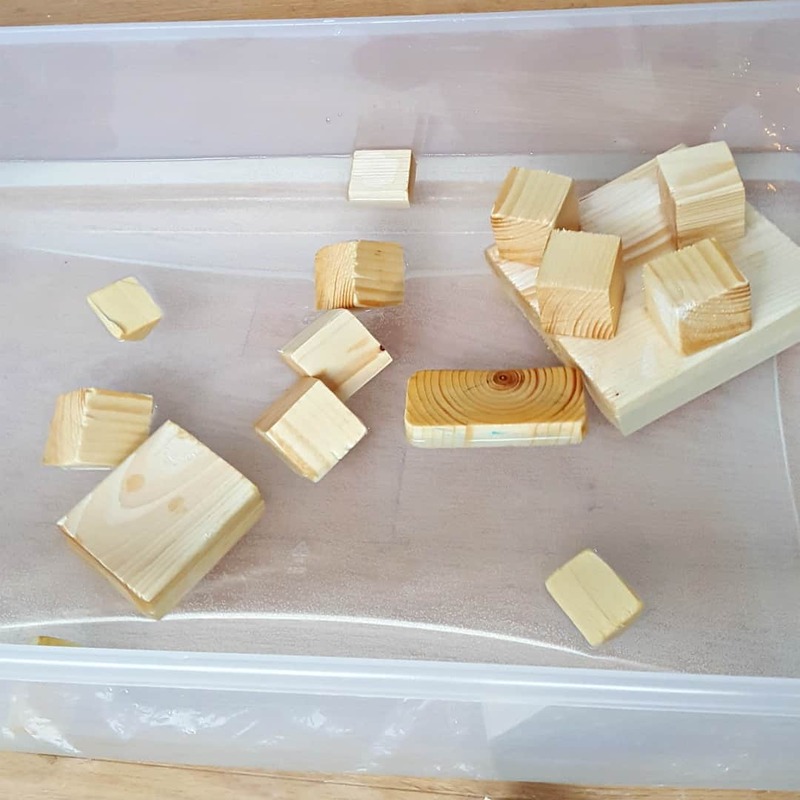 This simple activity is a fun way for toddlers to explore and experiment with wood blocks. I’m guessing you all have some form of wood blocks at home. These are one of the most played with toys in our house and if you don’t already have them you can get them HERE from Amazon. Introducing blocks of wood to water play has valuable benefits for toddlers, including sensory and cognitive experiences. The sizes and shapes of the blocks, the way the blocks move in the water, and the weight and feel of the blocks as they absorb water all contribute to early learning opportunities. 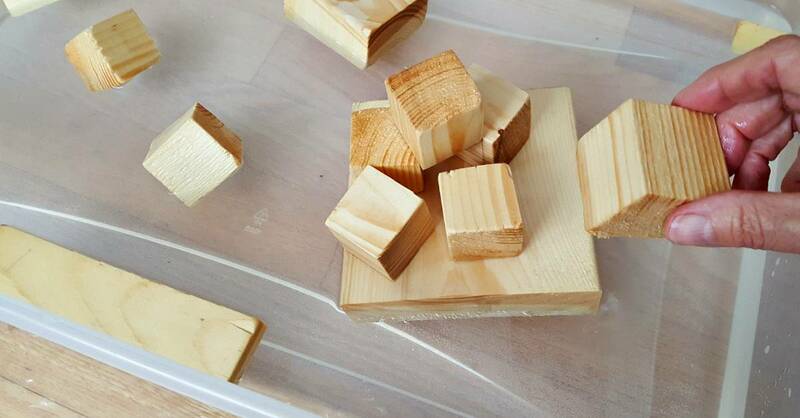 Add a variety of small wood blocks with different shapes and sizes to a tub of water. 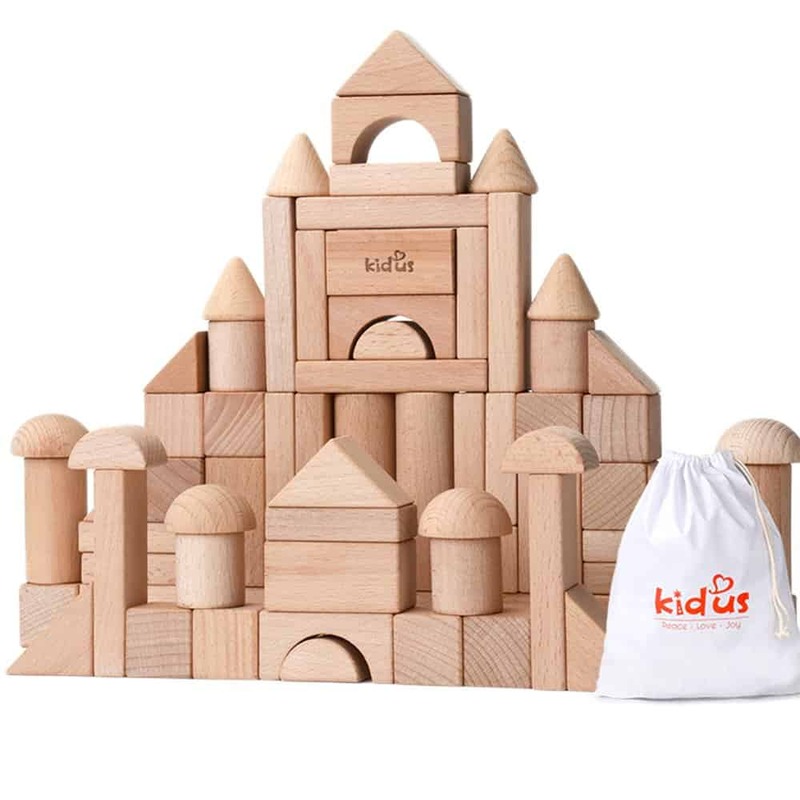 You can use blocks or other wood toys that you have on hand, or cut small pieces from scrap wood left over from a construction project as we did. 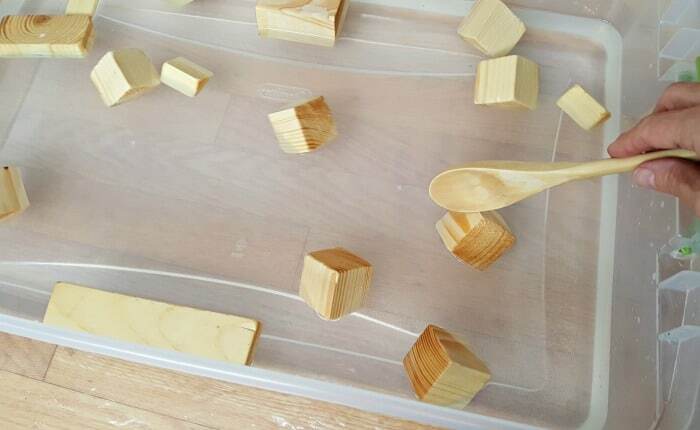 The wooden spoon is a fun grasping tool for stirring and scooping blocks, and splashing in the water. Observe with your toddler how the blocks move in the water. Do the blocks sink or float? The small blocks will roll around in the water but a larger block will float like a raft. Can you sink the raft? Pile the blocks on the larger block of wood to see if the wooden raft will sink. 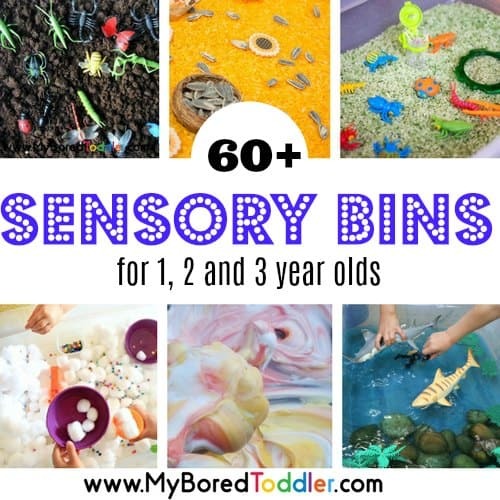 Poke the blocks to the bottom of the bin with the wooden spoon and watch them pop back up! Stand over the water bin and drop blocks into the water to make splashes! Extend the learning by adding letters or numbers to the wood blocks with a permanent marker. Your toddler can find a block with a letter in his name, or a number that corresponds to her age. Wooden blocks in the water bin provide a simple yet interesting activity for kids. 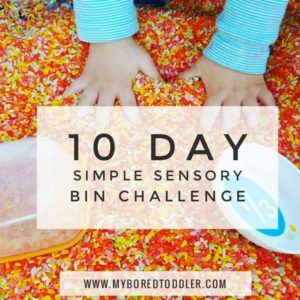 With minimal setup and lots of play value, this is one activity you’ll love to provide your toddler. 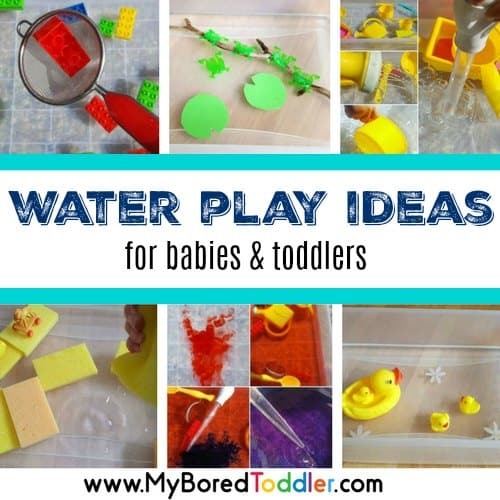 We have lots more great water play activities for toddlers and babies HERE.